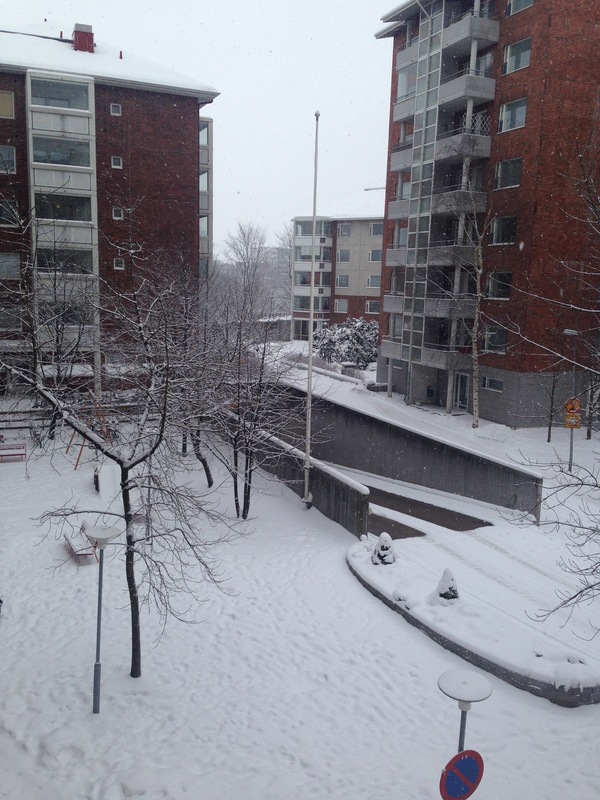 No blog about living in Finland for a year would be complete without an entry on winter. Now that the “dark days” are almost past, I’m about to miss my window. 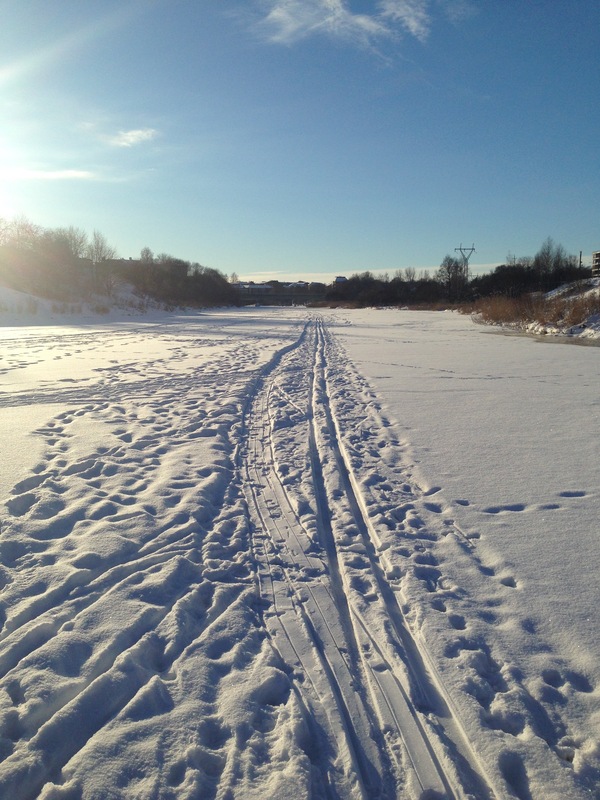 The title of this blog is a Finnish expression known by many as one of the most common activities of winter, and I admit I now understand why. When the “sun” doesn’t rise until after breakfast and starts going down after lunch, I see how easy it is for 4 pm (or, 16, as I continue to struggle to say) to become the new drink-thirty. I travelled outside of Finland for a few weeks over the holidays, so I had some time away from the dark days. However, while that short respite was a nice break, I generally really love winter. When it comes to weather, I have shed all of my north Florida. As a kid, I always dreamed of living someplace with snow, and true to that, I spent five years in Salt Lake City, two in Milwaukee, one in Western Massachusetts, three in Boston, and seven in New York City. Snow, no matter how many times I see it, is still a magical event for me. This was definitely a huge part of my attraction to Finland. 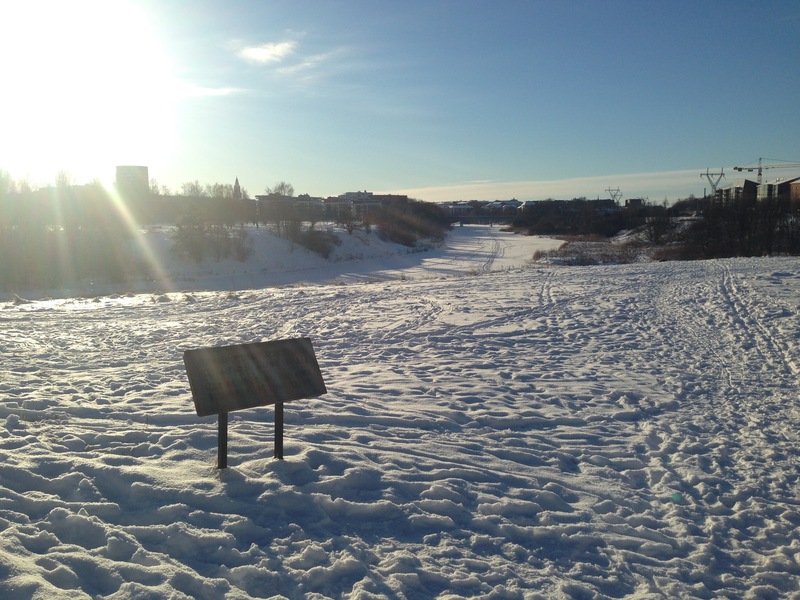 Yesterday after seeing multiple foot prints and ski tracks going right down the middle of the river, I finally got up the courage to do it myself. Don’t worry, mom and dad, I avoided the areas on the edge where I could see the water shining through. 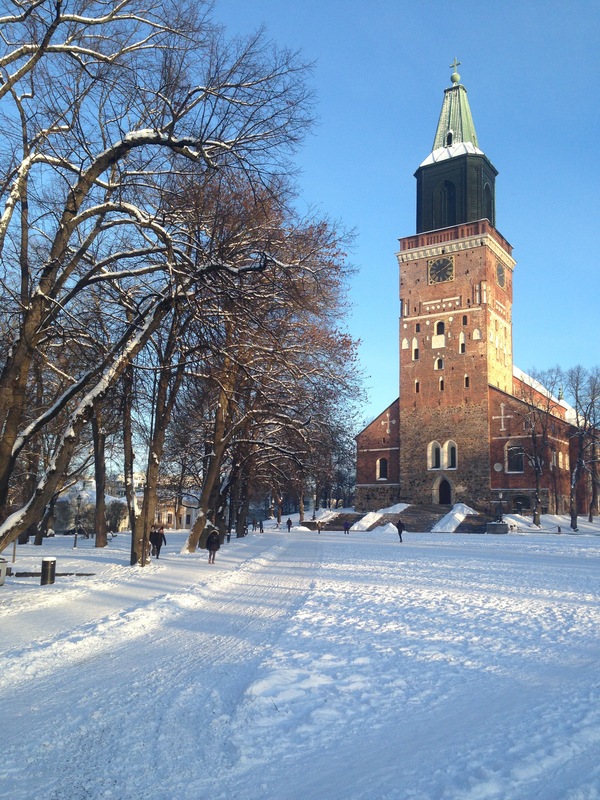 As readers can see, winter in Finland has been surprisingly sunny. Sure, there are many overcast days. And yes, the minimal hours of light were a little difficult, but also strangely beautiful. At one point, somehow almost all of the lightbulbs in my apartment burned out at the same time, and I just couldn’t face a trip to the store, so I sat in the dark afternoons with only my one lightbulb and the glow of my laptop feeling like an academic wolf in a cave. This time lapse video captures the striking differences between Finnish winter (when the sun barely rises) and summer (when the sun barely sets). In the comments, it’s noted that this video takes place in southern Finland, which is where I’m living, and that the contrasts become increasingly extreme the farther north you are. It’s actually not that different than when I lived in Milwaukee. I can remember leaving for work and returning home both in total darkness. Actually, it was colder in Milwaukee than it is here, or at least the wind was much more brutal. I can tell that I’ve acculturated to the winter darkness again because yesterday when I was walking through town at about five pm, I noticed that the sun hadn’t set yet and I was startled by how light it still was at such a late hour. 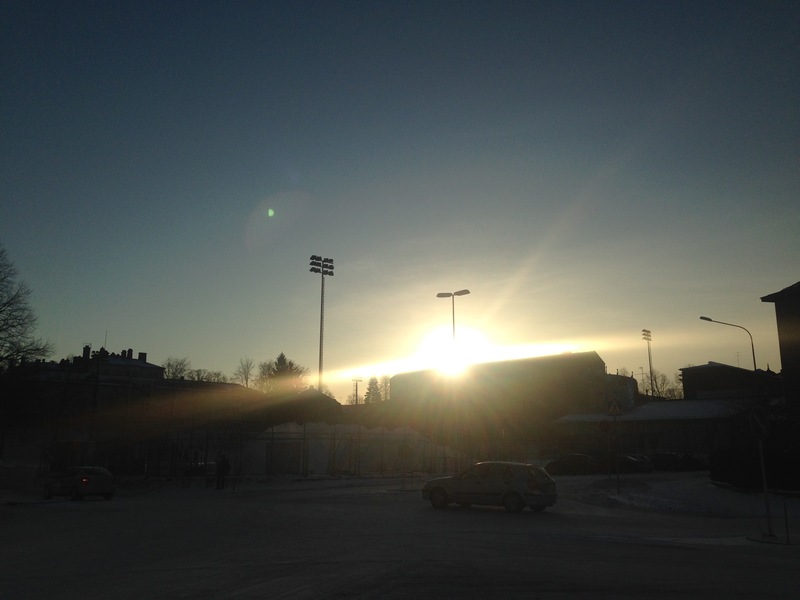 Here’s a photo of the sun going down at about 3:30 pm on a January day. The most important thing I would tell anyone about surviving winter in Finland has nothing to do with sun lamps or drinking, it has to do with personal safety, as in, not dying on icy sidewalks. You must ENTIRELY CHANGE THE WAY YOU WALK. This isn’t like in the U.S., where you might hit an icy patch on a sidewalk that they missed with the snow melt chemical salts, because in Finland they don’t use chemical salts. I repeat, there are NO chemical salts being used. NOTHING is being used to melt the ice. There is this sort of gravel that is put down that has minimal effect, but for the most part it’s like walking on a skating rink. I went down hard during the first icy day and that was a warning bell for me. As I write this post, I’m watching friends posting pictures on Facebook of the NYC blizzard. It’s been snowing all morning here, and I took this picture from my balcony. Every day is a snow day in Finland. In other words, there are no snow days in Finland. I’ve been amazed by how things just keep going, as evidenced by this photo from what was, for me, a harrowing two hour bus ride in the middle of the night when I arrived back after my holiday travel. I say it was harrowing for me, because no one else seemed to be concerned. 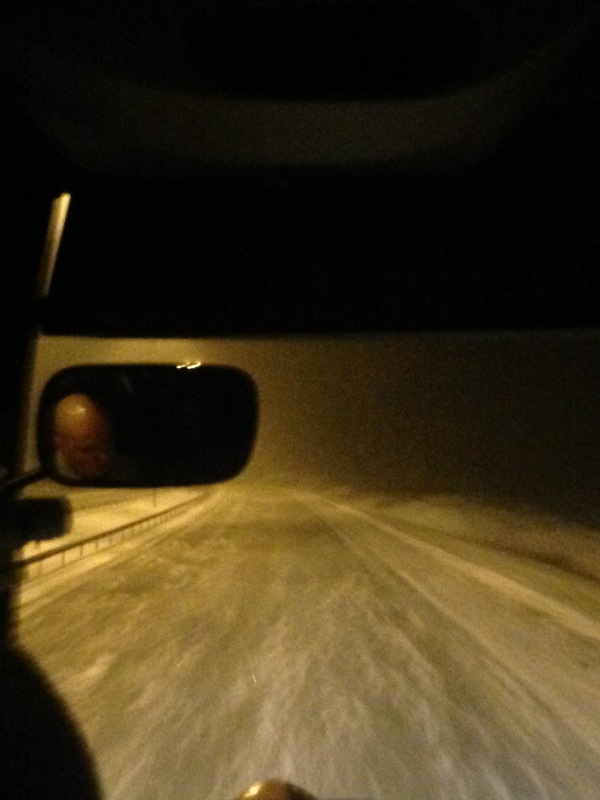 The bus driver was playing 80’s era Michael Jackson like it was a summer day and people on the bus were talking and eating like, oh, this is just any bus ride, not a bus ride through an unlit countryside (I’m talking no street lights at all) of blowing snow and icy roads. And of course we lived. And not only did we live, at no point did the bus slide or feel unstable or did anything else unsettling happen. Even when we were diverted by mysterious orange cones to some random side road that seemed to be made entirely of ice the bus driver was a master of navigation. As a friend here said: no matter what, the thing you can say about Finland is that everything basically works. Here’s to winter as an excuse for getting drunk alone at home in your underwear.